SELF-PROMOTION – What a struggle!! My Facebook page for my artwork is slowly growing. For that I am thankful, but I really don’t know how to get myself out there any more than I already have, you know? So the other day I made some calls to a few local businesses, and I obtained permission to place my business cards in two of them. But there was one place I was going to try to actually put my printed cards out to try and sell them until I found out they want a 60% commission. So yeah, I charge $5 for a card, and based on what I pay to get them printed, it wouldn’t be worth it to me. 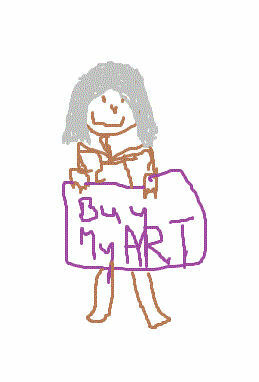 I know I could be getting my artwork out there in the community at that store, though, IF people bought them. But they had many other artists’ cards there for sale that were priced a lot cheaper. But I don’t know if they are selling. On the other hand, I have had a little bit of promise from some local places that will hopefully be looking at my work soon to see if it fits their needs. The local library displays things about local people, and I believe they have an art gallery. The lady who handles it is out of town now, but said she will get back to me when she returns. I know they are very community-oriented, so I hope I get an opportunity to get some exposure there. And in a few months, I will be getting the opportunity to hang some work in a local business that hasn’t opened yet. So that is still out there if everything goes well for their opening that is planned for sometime in May or June. As of right now, I just need to keep making art. I painted my huge sea turtle yesterday, but it didn’t really come out like I hoped it might, so I was a little disappointed. I wasn’t in a great mood when I began painting, and I think that had a lot to do with how I responded to it. But of course my husband and daughter love it. I plan to try and finish it today. So maybe later, you can see it! Posted on March 14, 2014, in Art Talk and tagged acrylics, drawings, painting, Watercolors. Bookmark the permalink. 4 Comments. So, you have a Facebook business page for your artwork? I want to start one myself. An old friend of mine has a large following on her. JeansPencil Art. She’s an exceptionally good artist I grew up with and we went out separate ways and I found her here on Facebook! The reason I hesitate to start my own business page is the SHIPPING and HANDLING. I sold my artwork in the past to a small number of people and I sent two through the mail- Framed! That cost so much money! Jean usually sell unframed and mails the artwork in a TUBE, all rolled up! Imagine that. Can I do that with my work? NO, it’s in 140 LB Hot Pressed Watercolor paper! Can I sell them unframed? What are you doing? I mostly make House, Blessings, Birth Announcements and Nameplates. I just started my Facebook page about a month ago. What I am doing is having several of my paintings made into 5×7 card prints, hoping to just sell those for now. I have announced them on there. My FB page is the same name as my blog if you want to go see. Anyway, I hear you on the shipping. I did ship an acrylic painting just one state south of here a few months ago, and it was a costly. I’m just charging $2 for shipping on the cards, unless someone orders a whole bunch. I have only gotten one order for one card so far. But I don’t have them yet. They should be ready in another week I think. Yes, you can sell prints unframed. Lots of people buy those!